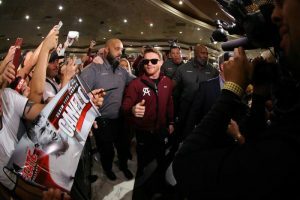 Lineal Middleweight World Champion Canelo Alvarez (49-1-2, 34 KOs) and WBC/WBA/IBO Middleweight Champion Gennady “GGG” Golovkin (38-0-1, 34 KOs) made their grand arrivals today at the MGM Grand Resort and Casino in Las Vegas ahead of their highly anticipated rematch on Sept. 15 at T-Mobile Arena, produced and distributed live by HBO Pay-Per-View® beginning at the special time of 8:00 p.m. ET/5:00 p.m. PT. They were joined by breakout Mexican star Jaime Munguia (30-0, 25 KOs), who will make the second defense of his WBO Junior Middleweight World Title against rugged Canadian contender Brandon “Bad Boy” Cook (20-1, 13 KOs) in a 12-round battle.Former IBF Middleweight World Champion David Lemieux (39-4, 33 KOs) of Montreal, Canada and Irish warrior Gary “Spike” O’Sullivan (28-2, 20 KOs) of Cork, Ireland will go head-to-head in a 12-round middleweight battle that has Fight of the Year candidate written all over it.Former pound-for-pound king and former four-division world champion Roman “Chocolatito” Gonzalez (46-2, 38 KOs) of Managua, Nicaragua will make his highly anticipated return against experienced Mexican warrior Moises “Moi” Fuentes (25-5-1, 14 KOs) in a 10-round super flyweight battle that will open the HBO Pay-Per-View telecast. When Bernard Hopkins speaks, you listen. It’s not just the engaging mannerisms or his glaring visage, though. That’s not why you’re drawn to him. Rather, his pull lies in the scope of his knowledge of boxing. It feels like he elaborates on the small crevices and details that blow past the mind of every other analyst or pundit. You probably didn’t notice the half-step back that fighter took to open up room for the hook. But Bernard did. Face it: he just sees the game completely differently than the rest of us. He’s a different breed. Argument can be made as to whether Bernard’s uncanny ability to dissect the in’s and out’s of boxing stems from his talent in the ring, or whether that talent is a symptom of his knowledge. Really, it doesn’t matter, because what can’t be argued is that Bernard has dominated the sport for a greater span of time than mostly any other boxer. But when news broke recently that Bernard’s last fight will be in 2017, the impending shadow of closure falling on his career finally felt like reality to those who have followed him closest. Bernard stated that he’d love to end his career the way Kobe Bryant did, and who wouldn’t? With 60 points his last game, recapturing his prime on the way out, it’s practically unfathomable. The problem is, boxing glory is largely proportional to the caliber of opponent across from you. Put it this way: the lesser the opponent, the lesser the spoils. And at age 51 with excessive time in-between fights, the odds against a picturesque ending continue to mount. It’s not like Bernard hasn’t trampled the odds before. He became the oldest belt holder in boxing history at 48 years old. He clobbered the legendary Felix Trinidad after few gave him any chance. Maybe the question we need to ask ourselves isn’t whether Hopkins can do it, it’s whether enough magic remains in the palms of his hands to clench out one last signature victory. To exit out on top, Hopkins is going to need the perfect dance partner. A noteworthy name, not too heavy, not too dangerous, not too prime, all ingredients required in his last opponent. So who comes to mind? What if a 3rd fight with Jean Pascal interests him? The two split their first two meetings, and a third summit against a potentially fading Pascal could bode well. Maybe Hopkins takes on heavy-fisted young gun Artur Beterbiev and does what he does best: defuses punchers of their power. Or, if he’s looking for a final pay day, there’s a titlist from the UK named James DeGale, who’s lighter, proven, and a ticket seller. All Hopkins needs to avoid is getting greedy. The worry is that, with a track record of surmounting the insurmountable, he will throw his chances to the wind and challenge someone like the winner of the Ward-Kovalev superfight. Both men would be favored against Hopkins any day of the week – especially considering that Kovalev already dominated Hopkins once. But with Hopkins, the rest of the equation figures itself out. He eats right, trains hard, and fights smart. Don’t doubt that he’s going to stray from destroying any chance to add one more notch to his belt. With all that being said, the stark truth remains that Hopkins really can’t disappoint us with a game effort. Even if he’s floored within the opening seconds, fans already have moments from his career to cling onto. But something beckons that this is more than icing on the cake. This is one last shot to defy the status quo. This is the lasting image the public will have etched in their minds whenever his name is brought up in legacy conversations. Even if he doesn’t admit it, much more is at stake than what appears on the surface. But just as Kobe long knew he’d hold his hand high in triumph as he departed Staples Center forever, somewhere deep down, Bernard Hopkins believes the same. Terence Crawford is one of boxing’s best talents and one of Top Rank’s most prized assets. Continued success will likely lead to future and bigger pay per view bouts, but Saturday night will be the first time that he’ll test the waters of pay per view. He will take on Golden Boy Promotions’ Viktor Postol, a credible challenger and a current undefeated title holder, for the WBC and WBO Junior Welterweight Title. Top Rank tried to place WBO Super Middleweight Champion Gilberto Ramirez in the co-main event of the evening in an effort to attract Mexican fans, but an injury to his middle finger on his right hand forced him to withdraw. However, two time Mexican Olympian Oscar Valdez will fight in the co-main event when he takes on Argentinian Matias Adrian Rueda for the WBO Featherweight Title and is one of Mexico’s best young fighters. The following is a preview of both of the world title fights on the HBO Pay Per View Card, televised live from the MGM Grand Garden Arena in Las Vegas, Nevada. Oscar Valdez was electric in his victory over Evgeny Gradovich in his last bout. He took on, an easily and badly defeated the former world champion in only four rounds. 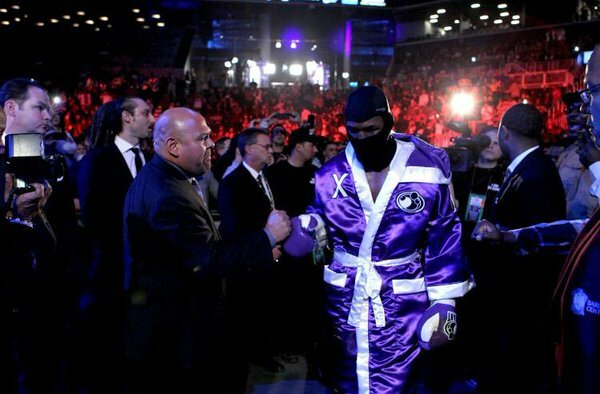 He has seventeen stoppage victories and has stopped four of his past five opponents. Rueda is also known for his power and has stopped twenty three of his opponents and is currently riding a ten fight knockout streak. Neither boxer should have a significant edge in either reach or power. Valdez, however, has a much deeper and successful amateur backgroundValdez is a former bronze medalist in the World Amateur Championship and a Gold Medal Winner at the AIBA Youth World Boxing Championships. He also qualified for the Olympics in 2008 and in 2012. Valdez also has the better profressional resume. He has defeated the likes of Evgeny Gradovich, Chris Avalos, Ruben Tamayo, Jose Ramirez, and Alberto Garza. He has also been active and fought four times in 2015 and this will be his second fight in 2016. Rueda has also been active and fought four times in 2015 and this will also be his second fight in 2016. However, his professional record is void of any impressive wins. This will only be the second time he has fought in the United States and has beaten a large list of unknown boxers in Argentina. Oscar Valdez was very impressive in his last bout and he will likely steamroll through Matias Adrian Rueda. This is the best fight that could be made in the junior welterweight division. Golden Boy Promotions and Top Rank Promotions put aside their differences to match up their two best junior welterweights. 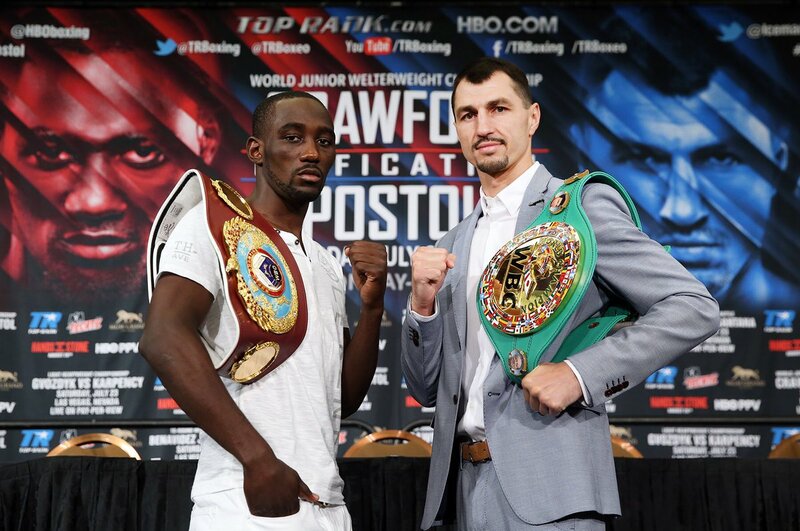 Terence Crawford dominated the lightweight division before jumping up to the junior welterweight division, and the difference in size will likely show as he will be giving up three inches in height and three and a half inches in reach to Postol. Both boxers were successful on their respective national circuits in the United States and in the Ukraine, but neither experienced major success on the international amateur stage. Crawford fights out of an orthodox stance, but also switches stances constantly while fighting and confuses his opponent while doing so. Postol fights out of an orthodox stance and has been improving in using his reach to hurt his opponents. Postol’s best wins were against Lucas Matthysse and Selcuk Aydin. He has also beaten Henry Lundy and DeMarcus Corley. Postol is good enough to beat most junior welterweights, but this writer does not think he is good enough to beat Crawford. Crawford will have to be slick and get within range while avoiding the jabs of Postol, but Crawford has shown his in-ring savy and intelligence are the best weapons he has. As long as Crawford remains focused and doesn’t look past Postol towards a possible fight with Pacquiao, he should emerge victorious.